Number ten embodies the qualities of a very independent force that rests within itself. It has a significant cooling power and glows brilliantly at an interplay of higher and lower energy levels. Duality and strength are its specific characteristics that correspond to the stable 2, 8 neon configuration. These number characteristics are revealed by adding the non-prime numbers (1+4+6+8+9+10=38 and 3+8=11 and 1+1=2) and the prime numbers (2+3+5+7=17 and 1+7=8). 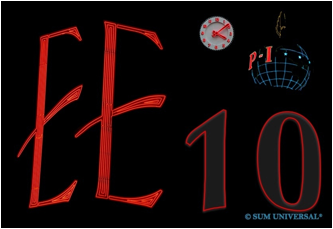 Mathematically, the all important role of number ten is that it is the basis of the decimal system. Although all numbers can be reduced to a single-digit number, number ten expresses totality, includes beginning and end of all numbers, returns to itself and allows for repetition. The chemical element that correlates with number ten is the non-metallic element neon, which is the fifth most abundant element in the observable universe, after hydrogen, helium, oxygen, and carbon. It is a light, colorless, odorless gas, known not to be toxic. It belongs to the inert noble gases. Due to its light weight and overall inactivity with other elements–does not form compounds with other elements–it is very rare on Earth. Neon's electron configuration is the very stable 2, 8 electron shell configuration (2 electrons occupy the inner shell & 8 electrons occupy the outer shell). Electrically excited neon–known as neon lighting–is ionized neon gas that emits colored light. An ionized neon atom has an electron in an excited higher state than in its usual ground state. When the electron returns to its ground state, the no longer neccessary excitation energy is carried away by a particle of light (a photon). The color or wavelength of the photon is dependent on the energy of the photon, which is the difference between the excited and the ground state energy of the electron. Ionized neon light has a distinct reddish-orange glow. Its practical use is found in brightly lit advertising signs with their characteristic colors. Neon's refrigeration capacity of liquid neon is much higher than that of helium and hydrogen, and it has the smallest liquid range of any element. ➣ 20Neon, stable isotope with ten protons and ten neutrons in its nucleus. ➣ 21Neon, stable isotope with ten protons and eleven neutrons in its nucleus. ➣ 22Neon, stable isotope with ten protons and twelve neutrons in its nucleus.